Spending quality time with your child is essential if you want to continue to grow your bond. However, it can be difficult to find the time to do anything as a family if both parents work and your child spends most of their time at daycare. 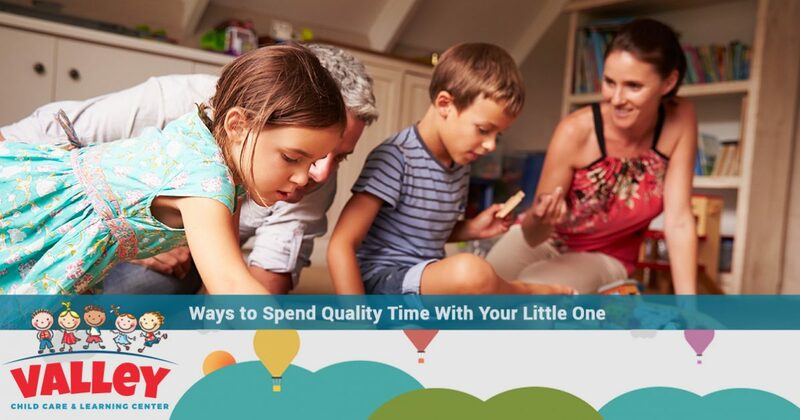 In a previous post, we discussed a few ways to make the most of the time you have with your child, and in today’s post, we will continue with a few ideas of things you can do when you finally find some free time to spend with your little one. Providing for your family is no easy task, and many families consist of two working parents. 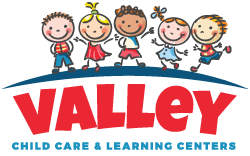 If you live in Phoenix or the surrounding area and you’re looking for a child care center that will provide your little one with a good education while you’re at work, then look no further than Valley Child Care & Learning Centers! With 10 locations throughout Phoenix, finding affordable child care that you can trust is easy! We offer everything from infant care to preschool learning opportunities. Our curriculums are designed to challenge your kiddo, while also encouraging them to try new things. If you’re interested in learning more, contact Valley Child Care & Learning Center and schedule a tour in a location near you today! When you come home from a long day at work, it may seem easier to quickly prepare a meal that everyone serves themselves and goes about their merry ways. 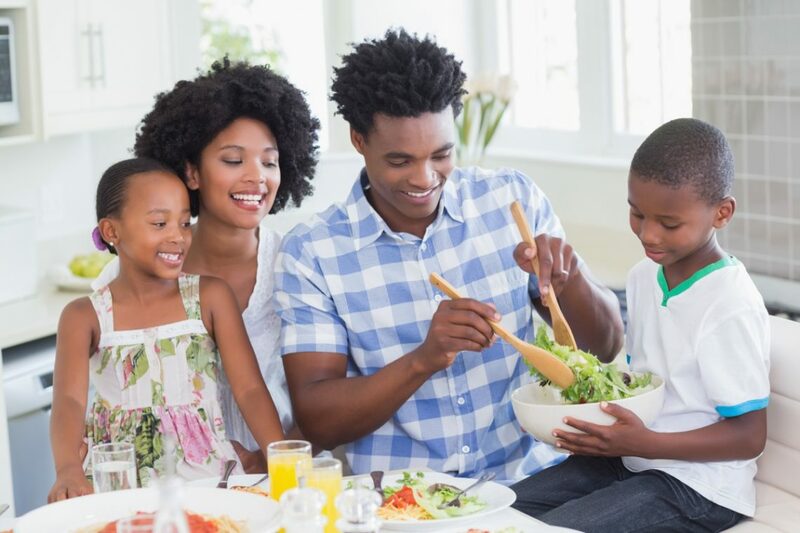 However, eating dinner as a family is a great way for you to reconnect with your children and hear about their daily adventures. Instead of letting everyone fend for themselves for dinner, try preparing an easy meal that you can sit down and enjoy as a family. As you eat, ask your little ones about their day. Not only will this help you connect with them, but you also may find that eating dinner as a family is a great way to unwind after a busy day. Young children spend most of their lives trying to keep up with their parents. You’re constantly taking them with you on errands or to appointments. Instead of taking your little one on another shopping trip as a way to spend time together, why not try doing something that they enjoy? Think of all of the times your child has asked you to play dress up, have a tea party, or build something together and you’ve been too busy. If you have some free time in your schedule, make it a priority to play one of their games with them. Agree to finally be the princess trapped in the castle or help them make a structure out of blocks. Chances are your little one will have a great time playing with you, and you will probably enjoy yourself as well. Another great way to spend time with your child on a daily basis is to develop a bedtime routine. In order to get the right amount of sleep each night, it’s healthy for children to have a specific routine when they go to bed. Depending on the age of your child, they may be able to get ready for bed on their own. However, they will most likely enjoy their routine much more if you’re involved. Make it a point to read a book to them each night, or have a special song that you sing before they fall asleep. If you go to bed early so that you get enough sleep before work, perhaps you can develop a routine where you and your kiddo get ready for bed at the same time! These are just a few suggestions for ways you can spend more time with your child. At Valley Child Care & Learning Centers, we encourage parents to get involved with their children’s lives, which is why we strive to keep you in the loop about everything they do and learn while at our child care facility. If you are interested in learning more about our preschool learning curriculum or any of our other programs, be sure to contact the Valley Child Care & Learning Centers nearest you.